Lance Naik Mohammed Firoz Khan of the Indian Army's 38 Rashtriya Rifles counter-insurgency unit postponed proceeding on leave for Eid this week to remain on patrol on the Line of Control in Jammu & Kashmir. Yesterday, a day before the festival, he was killed in heavy shelling by the Pakistan Army in Poonch sector of the frontier. Yesterday's violation was part of a near continuous series of unprovoked violations of the ceasefire by Pakistan Army units deployed on the LC. A heavy exchange of fire began this morning at 10.40AM in the Krishna Ghati area in Poonch and Bhimber Gali area in Rajouri. 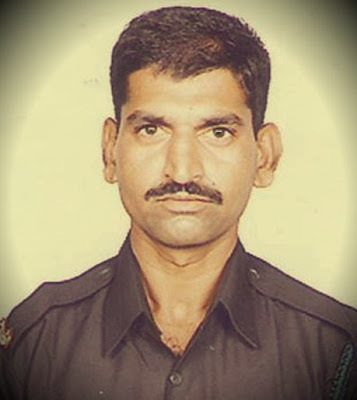 31-year-old Lance Naik Khan, who lived in Hyderabad, leaves behind his wife and two young children. R.I.P.